1. Fold the front of your Dovecraft 6x6 Kraft card blank back on itself to create a Z fold. 2. Cut a 14.8cm x 14.8cm square from your First Edition Wild at Heart 6x6 paper pad. Adhere this to the inside of your card, on the right hand side, with Dovecraft Perma Fix Tape. 3. Next, cut a 7cm x 14.8cm strip of coordinating Wild at Heart paper and stick it the front of your folded section on your card blank, with Dovecraft Perma Fix Tape. Ensure to centre it so you’re left with a border. 4. Pick a complementing Wild at Heart sheet and stick your Dovecraft Chipboard frame to the back of it. Use a craft knife to cut out the aperture and the cut off the excess around the frame. 5. Cut a 9cm x 9cm square of Wild at Heart paper. Die cut the Dovecraft reindeer to the centre of this sheet. TIP: Save the reindeer die cut for another craft project. 6. Cut a coordinating 9cm x 9cm piece of Wild at Heart paper and stick this behind the reindeer aperture. Ensure to use a contrasting coloured sheet so that the die cut stands out. 7. Adhere your die cut design to the back of your frame at an angle, using Dovecraft Perma Fix Tape. TIP: Before adhering, make sure the reindeer die cut is in the centre of the frame. 8. Die cut a Dovecraft button on to a Wild at Heart sheet, thread it through a length of Dovecraft Twine and wrap it around the bottom of your frame. Adhere your frame with Dovecraft Perma Fix Tape at an angle, to the edge of the folded section on your card. 9. 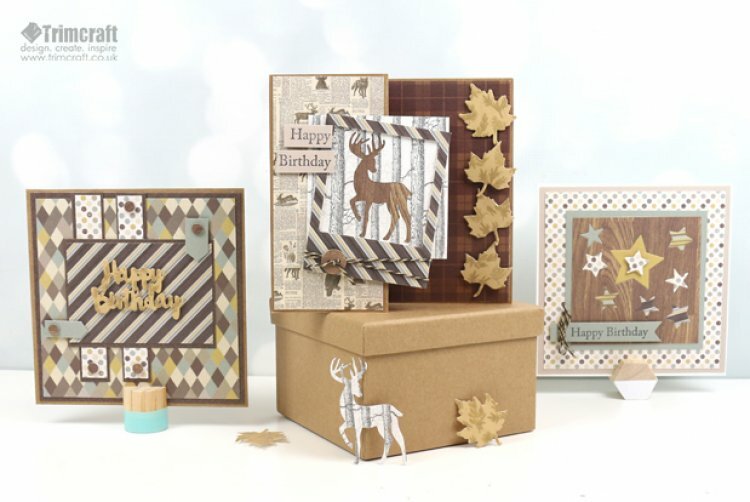 Next, die cut the Dovecraft leaf die 4 times on your chosen Wild at Heart sheet. Stick each one vertically, along the right hand edge of your card with 3D foam pads. 10. Stamp your chosen sentiment with the Dovecraft Clear Stamps or Simply Creative Alphabet Clear Stamps set on a piece of Wild at heart paper. Cut out and adhere it with 3D foam pads to the folded section on your card. For an alternative design, you could use the Dovecraft Star dies and die cut a selection of different shaped stars on your chosen Wild at Heart sheet. To add detail, fill each aperture with a different paper design. Once done, layer onto a selection of Wild at Heart sheets and finish with a stamped sentiment. To create a stand out look, layer the Wild at Heart paper designs both vertically and horizontally on your card blank. Experiment with shape and size to add interest to your make. Finish by adding the Dovecraft Happy Birthday die cut to the centre, with 3D foam pads. The Wild at Heart paper designs vary so much, enabling you to create a unique project each time you use this diverse pad! How will you use the nature inspired papers? We would love to see your masculine crafts so remember to upload them to the project gallery and to #trimcraft when uploading to social media.